More than 100 professors, researchers and students from throughout the world gathered on the Minneapolis campus of Saint Mary’s University of Minnesota for the fifth annual International Symposium on Lasallian Research, September 25-27, 2016. This year’s symposium promoted research done by Lasallians aimed to meet the needs of society, with a focus on personal needs and the poor. 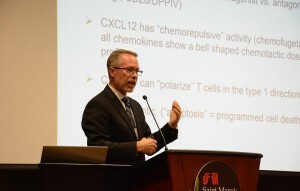 The symposium featured three keynote presentations, which focused on HIV/AIDS and people who don’t have access to resources to fight the disease, a clinical trial on a new drug for Multi-Drug Resistant Tuberculosis (MDR-TB) among children, and Lasallian- and trauma-informed care in Lasallian youth and family ministries. Breakout sessions highlighted topics including current issues in the areas of educational innovation, environment and sustainability, health and nutrition, and Lasallian studies. Saint Mary’s University of Minnesota and its Institute for Lasallian Studies host the gathering, which is co-sponsored by Christian Brothers Conference.